Tannins have shown antifungal effects and have been considered a potential natural compound for wood preservation. 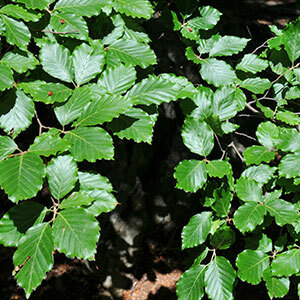 Extracts produced from softwood bark contain both tannins and non-tannin compounds, which may reduce the effectiveness of tannin used as a wood preservative. The purpose of this research is to study the environmental impact of hot water extraction, identify the hot spots within the tannin cradle-to-gate life cycle and give suggestions to optimize its environmental profile. Different extraction and post-extraction scenarios of tannin production are compared using the life-cycle assessment method. Experiments were designed to study the tannin yield under different extraction scenarios; the post-extraction scenario analysis was based on literature review. The results show that the extract drying process is the primary contributor to the environmental impact of tannin production. Both preliminary cold water extraction and ultrafiltration after extraction are beneficial as they have fewer non-tannin compounds in the final products; however, preliminary cold water extraction had a considerably lower environmental performance. Successive extractions using fresh water at each cycle increased the total tannin yield, but increased the environmental burden. Using only evaporation to obtain a desired tannin concentration is not environmentally efficient. This paper provides a quantified environmental analysis for the development of tannin-treated wood products and discusses the different tannin extraction scenarios from an environmental point of view. Condensed conifer tannins as antifungal agents in liquid culture. Journal of Holzforschung 67 (7): 825-832. Flux behaviour and energy consumption of ultrafiltration (UF) process of milk. Australian Journal of Agricultural Engineering 1 (2): 54-65. Comparison of greenhouse gas emissions from forest operations in Finland and Sweden. Forestry 76 (3): 271-284. Characterization of condensed tannins and carbohydrates in hot water bark extracts of European softwood species. Phytochemistry 120: 53-61. Hot water extraction of Norway spruce (Picea abies [Karst.]) bark: analyses of the influence of bark aging and the process parameters on the extract composition. Holzforschung 70 (7): 619-631. CML-IA characterisation factors. Center of Environmental Science, Department of Industrial Ecology, Leiden University, The Netherlands. Sustainability of construction works. Environmental product declarations. Core rules for the product category of construction products. SFS-EN 15804 + A1, Finnish Standards Association, Helsinki, Finland, pp. 97. Eucalyptus and leguminosae, Part 01: Acacia mearnsii. Eucalyptus Online Book and Newsletter 14 (2008): 13. Studies of grinding of wood and bark-wood mixtures with the szego mill. PhD thesis, University of Toronto, Canada, pp. 182. Environmental management - Life cycle assessment - Principles and framework. International Organisation for Standardization, Geneva, Switzerland, pp. 20. Environmental management - Life cycle assessment - Requirements and guidelines. International Organisation for Standardization, Geneva, Switzerland, pp. 46. Greenhouse gas emissions from the use of primary energy in forest operations and long-distance transportation of timber in Finland Forestry. Forestry 69 (3): 215-228. Spruce bark as an industrial source of condensed tannins and non-cellulosic sugars. Industrial Crops and Products 52: 158-168. The fixation of new alternative wood protection systems by means of oil treatment. Material Science (Medžiagotyra) 17 (4): 402-406. Stilbene impregnation retards brown-rot decay of scots pine sapwood. Holzforschung 70 (3): 261-266. Extraction of polyphenols from grape seeds and concentration by ultrafiltration. Separation and Purification Technology 48: 176-181. Antimicrobial defences in the wood of living trees (Tansley review no. 87). New Phytology 132: 203-233. Membrane performance and application of ultrafiltration and nanofiltration to ethanol/water extract of Eucalyptus bark. Separation and Purification Technology 132: 234-243. Tannins: major resources, properties and applications. In: “Monomers, Polymers and Composites from Renewable Sources” (Belgacem MN, Gandini A eds). Elsevier, Oxford, UK, pp. 179-199. Pressurized hot water extraction of bioactives. Trends in Analytical Chemistry 71: 39-54. Life cycle assessment of green pilot-scale extraction processes to obtain potent antioxidants from rosemary leaves. The Journal of Supercritical Fluids 72: 205-212. Supply of electricity by energy source. Web Site. Energy prices in heat production, June 2016. Web site. Antifungal properties of some plant extracts used as wood preservatives. International Biodeterioration and Biodegradation 85 (3): 23-28. New products from bark to replace fossil compounds: adhesives and insulating foams from softwood bark tannins. VTT, Finland, Web site. Environmental friendly wood preservative system based on polymerized tannin resin-boric acid for outdoor applications. Ciencia y Tecnologia 12 (3): 253-257. Tannin-boron preservatives for wood buildings: mechanical and fire properties. European Journal of Wood Products 70: 689-696. Impregnation of Scots pine and beech with tannin solutions: effect of viscosity and wood anatomy in wood infiltration. Wood Science and Technology 47 (3): 615-626. Pressurized hot water extraction and processing. In: “Enhancing Extraction Processes in the Food Industry” (Lebovka N, Vorobiev E, Chemat F eds). CRC Press, Boca Raton, FL, USA, pp. 223-254. Secondary metabolite concentrations and terpene emissions of Scots pine xylem after long-terms forest fertilization. Journal of Environmental Quality 31: 1694-1701. Utilization of organic waste and residues in natural fiber-polymer composites: a review. Waste Management 54: 62-73. Concentration, dehydration, and drying. In: “Energy Efficiency and Management in Food Processing Facilities”. CRC press, Boca Raton, FL, USA, pp. 218. Wooden building products in comparative LCA. Journal of Life Cycle Assessment 12 (7): 470-479. The ecoinvent database version 3 (part I): overview and methodology. The International Journal of Life Cycle Assessment 21 (9): 1218-1230.